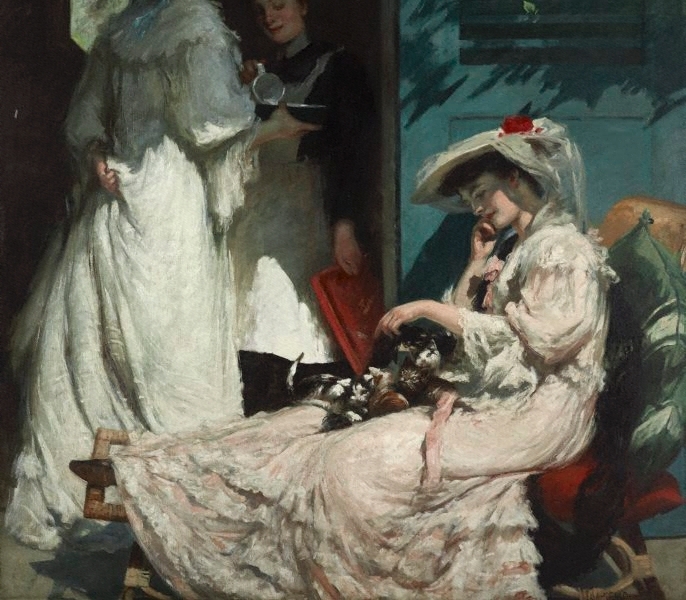 Salon painting as a precept and as a practice had no more loyal adherent than Rupert Bunny. Born and educated in Melbourne, Bunny began a lifetime of European travel and residence in 1884. The success of his academic and essentially escapist project in Paris and London was real, complicit though it proved to be with the self-delusion of an age on the edge of war. Bunny's dedication to the good life resulted in some of the most sumptuous paintings in Australian art history, and the most admired. The artist's wife, kittenish herself, plays with a lapful of cats. Her companion accepts a basin of milk from a meaningfully shadowed maid. As upholstered in privilege as they are in their lacy day-gowns, Bunny's women are the late-picked fruit of a century whose heyday had passed. Despite his stylistic conservatism, the painter kept a finger on the pulse of taste. He responded to post-impressionism and fauvism, albeit belatedly, in a series of brilliantly coloured compositions on classical themes in the 1920s. During that decade, Bunny returned twice to Australia, settling permanently in 1933. 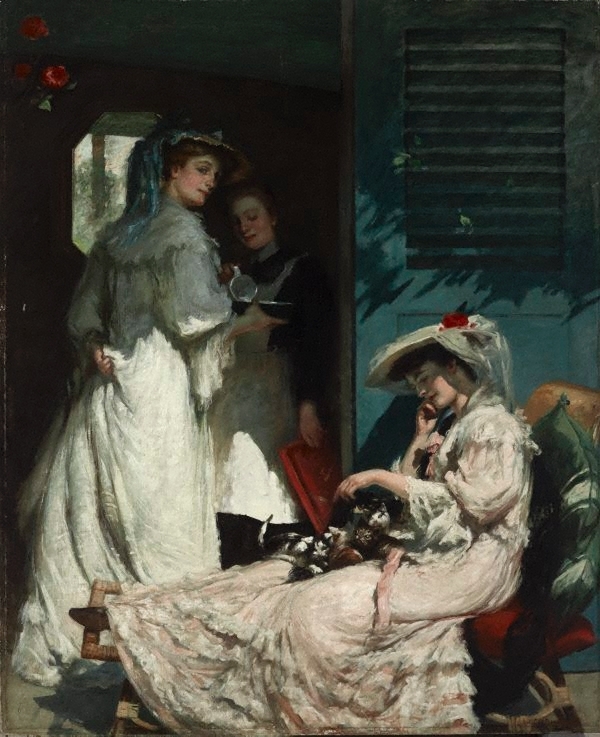 Music, in which he had always had a parallel interest, became increasingly important to him: even so palpable a painting as 'A summer morning', with its plump depictions of fabric and flesh, has a musical ethereality. Signed l.r. corner, brown oil "Rupert C W Bunny". Not dated. 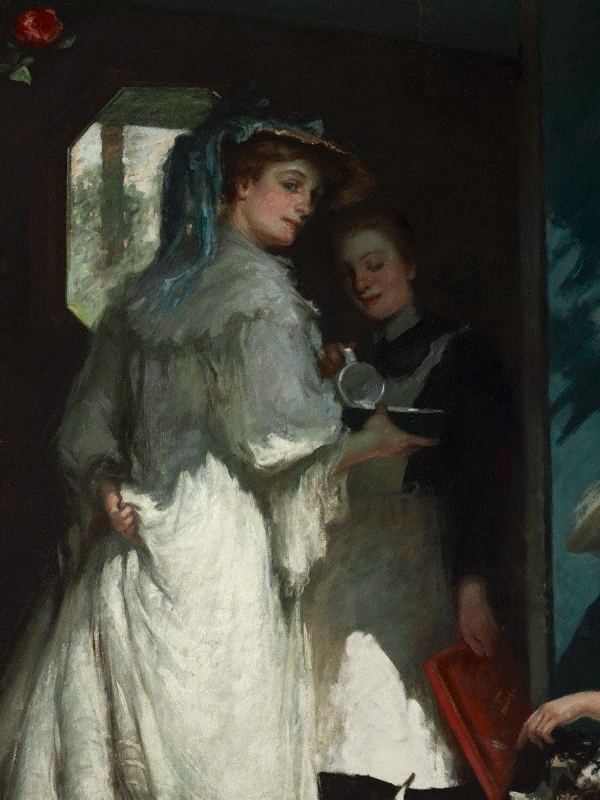 Deborah Edwards, Look , 'Rupert Bunny: An exotic in the history of Australian art', pg. 28-32, Sydney, Nov 2009, 31, 32. Anne Gérard, Look , 'Oz arts: Our painters in the Paris Salons', pg. 37-39, Sydney, Dec 2006-Jan 2007, 39. Caroline Holmes, Impressionists in their gardens , 'Fur, fowl and flutter', pg. 142-153, Suffolk, 2012, 142 (colour illus., detail), 143 (colour illus.). 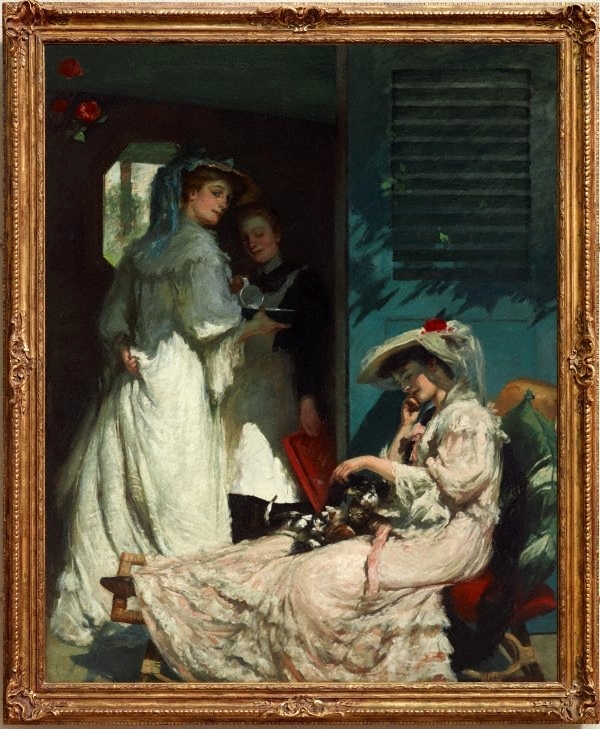 David Thomas, Deutscher and Hackett fine art auction: Sydney 28 August 2013 , 'Rupert Bunny', pg. 146-147, Melbourne, Aug 2013, 146. Singing in the heart: Music and the art of Rupert Bunny , 'The later belle époque', pg. 46-68, Queensland, 2007, 60. Les Peintres Australiens Dans Les Salons Parisiens de 1886 a 1914 , Sydney, Jun 2006, 104, 122, XCV (colour illus.). Parallel visions: works from the Australian collection , Sydney, 2002, 15, 26, 22 (colour illus.). Australian art: in the Art Gallery of New South Wales , Sydney, 2000, 87 (colour illus.). Peintres Australiens à Etaples , Étaples-sur-Mer, 2000, 116, 49 (illus.). Art Gallery of New South Wales handbook , Sydney, 1999, 129, 129 (colour illus.). Rupert Bunny: An Australian in Paris , Parkes, 1991, 8, 17, 8 (illus.). Art Gallery of New South Wales: highlights from the collection , Sydney, 2008, 64 (colour illus. ), 65 (colour illus., detail).